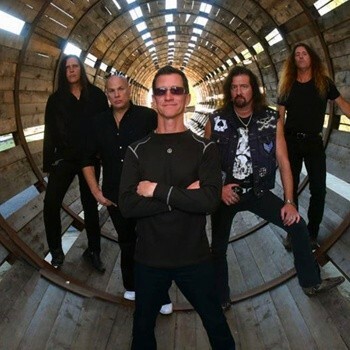 For Metal Church, line-up changes and the tragic death of original singer David Wayne left the band somewhat lost to time in the Power Metal/Thrash movement. With the return of their second singer Mike Howe and last year's release of 'XII', the band are back on the Metal map and gigging hard. The Underworld is set beneath The World's End pub and today is a super-hot day. Luckily the air conditioning keeps the capacity audience cool with only the scorching guitar riffs of Kurdt Vanderhoof firing into the audience. Former W.A.S.P. drummer Stet Howland keeps things super tight as he pounds out the beats. These days Howe looks considerably different, shorn of his once long locks he bounces around the stage, at times, almost touching on dad dancing! Only his strong Metallic vocals remind us of his Metal heritage. Bass player Steve Unger not only supplies some rock-solid bass playing but some terrific backing vocals as well. The set is a mixture of old-school anthems – like the classic 'Watch The Children Play' and 'Beyond The Black' – and new material like 'Killing Time'. The audience, a mixture of all ages, welcome every song like it's the last. The band clearly appreciate this and deliver their impressive set while founder member Vanderhoof can hardly contain his smile throughout the show. If I have one complaint, it was the omission of what I consider the bands signature tune 'Metal Church' – hopefully next time the guys will rectify this.